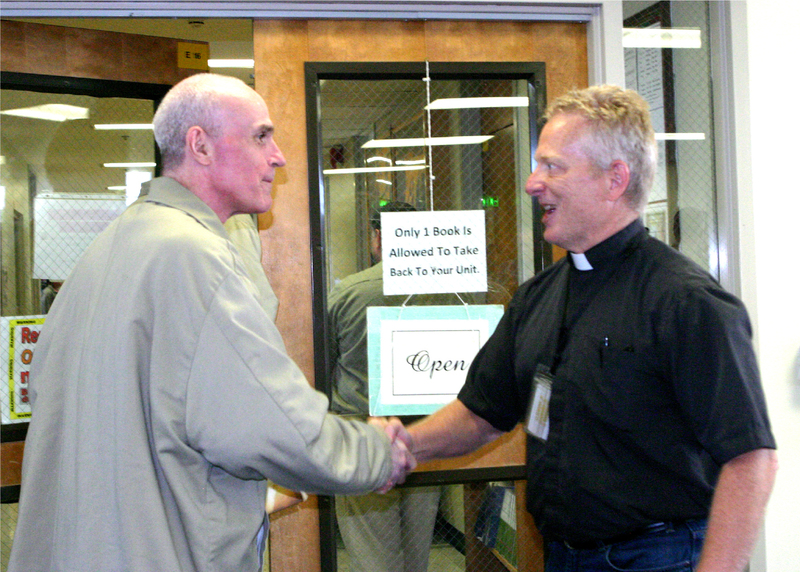 Pastor Norm Arnold shakes the hand of an inmate at a worship service last April. SHELTON - The Rev. Norm Arnold used a shell to scoop water from a wooden font and gently poured it over the head of a tall, dark-haired man in a gray jumpsuit with tattoos down his left forearm. “Make them say no to the things that got them here. Pray for these men as they go forward. Restore them, reconcile them in spirit and your truth,” Arnold, 55, said in prayer. 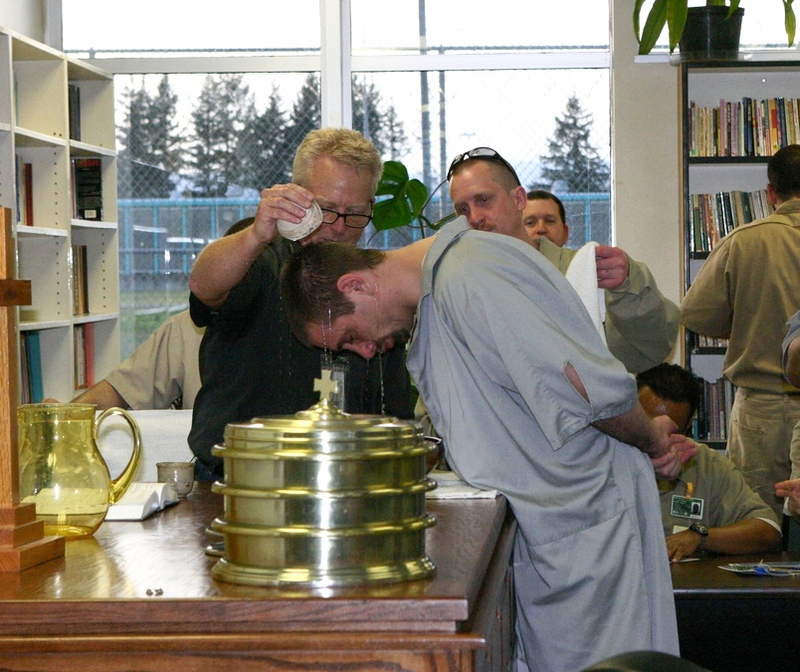 More men, all inmates at the Washington Corrections Center, (WCC), waited in line for their turn to be baptized. They’re all part of the Living Stones Prison Congregation, one of only 20 officially recognized prison congregations in the country. The WCC congregation will celebrate its 10th anniversary in September. Arnold, the Living Stones pastor for the past three years, said the best part of prison ministry is being able to use faith to restore the hope of those who say they’ve lost it because of their past actions. Arnold grew up near Atlanta, Ga. and spent 21 years in the U. S. Air Force. He married his wife after meeting her in the Netherlands during his military service. Family brought him to the Pacific Northwest, where he became a pastor at a Lutheran church. Prior to working in the church, he also spent some time as a mental health care provider, where he worked with people recovering from substance abuse as well as children and other adults. When approached to do prison ministry, Arnold wasn’t sure if he wanted to do it. He had worked with vulnerable people before in a health care setting, but “I had my own ideas of what it means to be in prison, and what it would be like to work here,” Arnold said. When asked to become pastor at WCC, Arnold initially walked away and said, “I’ll pray on it.” But as he thought about the opportunity that night, Arnold said he got a strong feeling that prison ministry might be his destiny. The Living Stones congregation began at WCC ten years ago, with collaborations among the prison, community members and clergy. Ed Nesselhuff, pastor of a successful prison congregation in Maryland, made it his mission to start congregations in prisons across the country, including in Washington state. He worked with John Kenton O’Neal, a former inmate who became a pastor, to start the congregation at WCC in 2006. O’Neal had served an 18-month prison sentence for manslaughter at WCC during the late 1960s. After he completed his prison sentence, he lived and worked at Holden Village, a Lutheran retreat center at Lake Chelan for a year. He and his wife moved to Anacortes in 1972, where they ran a marine electronics business for a couple of years. In 1974, O’Neal was invited back to work at Holden Village. He often said the pastors he met at Holden Village helped him put his life back together after he was released from prison, and his experience at Holden Village greatly influenced his decision to become an ordained pastor. 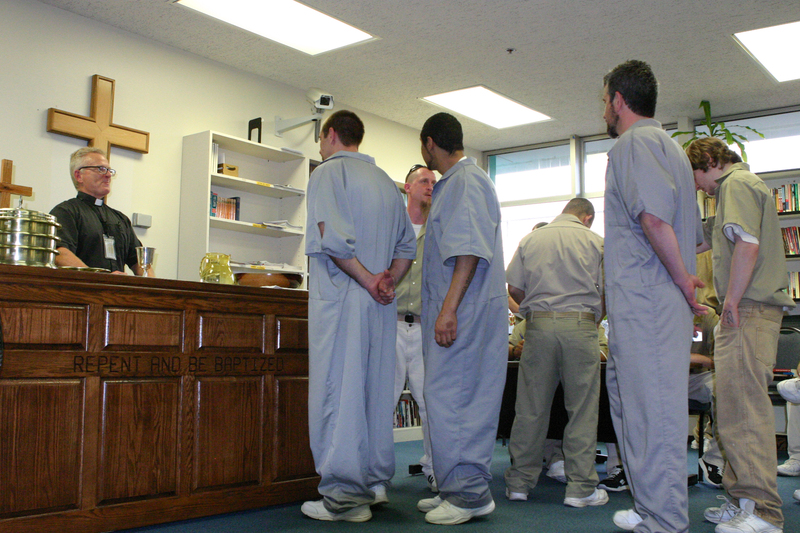 Today, Arnold continues to keep Nesselhuff and O’Neal’s vision of a prison ministry alive. He leads worship services every Saturday evening, and often brings a handful of volunteer parishioners from other churches to help. The atmosphere during the 90 minute worship is a lively one. An inmate band of 15 men sing and play guitars, drums and a keyboard. As inmates trickle in, they join in song, clap their hands and smile as Arnold greets them at the big metal doors of the chapel. Arnold preaches, often asking the inmates how God has changed their lives. Toward the end of the service, men line up to receive a Eucharist of communion wafers and grape juice. Occasionally, men will ask to be baptized. Arnold estimates he’s performed around 300 prison baptisms since he became pastor for the Living Stones. The weekend worship service has become popular among inmates. 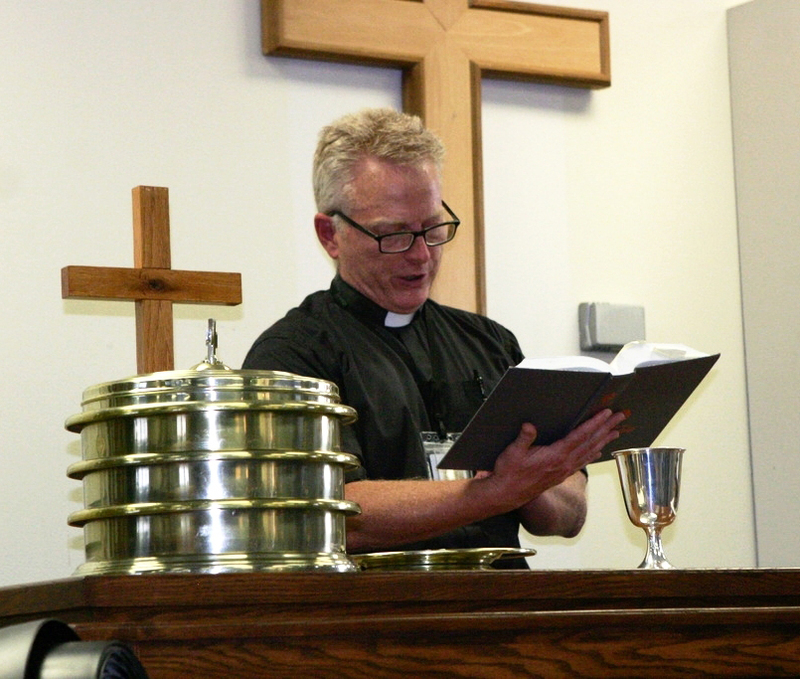 When Arnold began working at WCC three years ago, the congregation had about 10 to 20 people. Today, the worship service usually draws anywhere from 70 to close to 100 attendees. Arnold said the spiritual connections inmates make through the Living Stones inspires them to want to become better people. Lawrence Latta, III said he’s an example of that. He was an offender at WCC who was released into community custody last month after serving a 16 month sentence on identity theft charges. He said Arnold helps inmates see the good in themselves and vow to make better choices when they eventually return to their communities. In addition to presiding over worship services, Arnold leads bible studies once a week and takes on duties of the prison’s current chaplain, Greg Garringer, when he’s not available. Arnold also counsels inmates who come to him with problems, or who are depressed and need someone to talk to. They’re duties Garringer says aren’t easy, but are important parts of prison work that Arnold takes on with pride. In addition to holding services in prison, the congregation also helps former inmates outside prison walls. For example, Arnold and volunteers regularly collect new and gently used clothing and personal hygiene and toiletry items for a freedom backpack program that began last year. Inmates who have completed their prison sentences receive the backpacks filled with these items upon release. Living Stones volunteers have also started a community fellowship for former inmates and their families called the “LS 180 Project.” They meet at a church in Lacey Sunday evenings for dinner, where they can talk about the challenges they face as they try to reestablish themselves, such as finding safe, secure housing, finding a job, dealing with feelings of isolation and reconnecting with and gaining trust from family members. Living Stones is also working with a group of business students at Pacific Lutheran University to come up with a business plan they hope to use one day to open a resource center for former inmates who are reentering society that offers employment coaching, independent living skills training, substance abuse counseling and connections to community services to help them rebuild their lives.